Are you interested in a rewarding career in perioperative care? Have you got excellent management skills and a passion for supporting others? Start your journey to becoming a vital part of the theatre team with our BSc (Hons) Operating Department Practice (ODP) course. 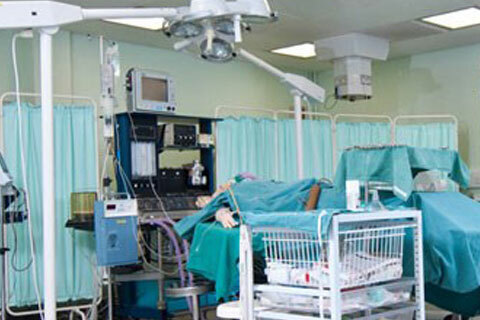 Operating Department Practitioners work within operating theatres and critical care areas. They are required to be responsive, anticipate requirements of both patients and staff, whilst providing the highest standards of perioperative care. Upon successful completion of this course you will be eligible to apply to the Health and Care Professions Council for registration as an Operating Department Practitioner. The course combines theoretical and practical skills, complemented with clinical placements in a range of specialities and settings. Our approach to learning means that you will leave with clinical competence and the ability to apply best knowledge to direct patient care in contemporary healthcare settings. Your work will be assessed using a mix of methods including text based submissions, written examinations, oral examinations, presentations and clinical skills assessment both in placement and within simulated learning environments on campus. You will be encouraged to develop and demonstrate a range of skills to prepare you for a successful career as an Operating Department Practitioner, including confidence in care delivery, the ability to research, appraise and evaluate evidence. You will study at our recently extended £71 million City South campus in Edgbaston, Birmingham, complete with a fully equipped operating theatre, mock wards and specialist surgical simulation facilities to support you as a practitioner throughout the course. Our academic team are dedicated to your development and have many years of experience in delivering perioperative education in academic and clinical settings, with many of our staff still actively working in operating department practice roles. Our experience provides an excellent resource that will help you develop a clear understanding of the relationship between theory and practice. Practicing staff - many of our staff are still active operating department practitioners, so you can rely on them for all the practical guidance, advice and knowledge you need. Study abroad - our students are able to work abroad to enhance their skills and development as a part of our unique international travel scholarship programme. See where our ODP students have visited recently! Student loan finance - have you already studied an undergraduate degree but would like to do a second one in Operating Department Practice? You may be eligible for funding. We now recruit to the values of the NHS constitution. This influences our selection criteria and especially the values we are seeking to be demonstrated in both your application and interview, which we view as essential in any individual involved in patient care. A minimum of three GCSEs at Grade 4 or above (formerly C), must include English Language, Mathematics and Science or equivalent. A minimum of 5 Ordinary levels at Grade B3 or above, must include English Language, Mathematics and a Science subject. A minimum of five Intermediate Standard 2 or above, must include English Language, Mathematics and a Science subject. 112 UCAS points from a maximum of three A/A2 Level passes, which must include one of Health & Social Care, Human Biology, Biology, Physics, Chemistry, Applied Science, Psychology or Social Science at Grade B. A typical offer would be BBC. General Studies, Critical Thinking and Extended Project not accepted. 112 UCAS points from a maximum of two AS/A1 Level passes, plus a maximum of two A/A2 Level passes at Grade C or above, which must include one of Health & Social Care, Human Biology, Biology, Physics, Chemistry, Psychology or Social Science. 112 UCAS points from A* A* profile or combined with UCAS points from a maximum of one GCE A/A2 level. General Studies, Critical Thinking and Extended Project excluded. Acceptable only when combined with other Level 3 qualifications. 112 UCAS points from Distinction, Merit, Merit profile. BTEC Extended Diploma (QCF) in Health and Social Care Society, Health and Development, Science or equivalents 112 UCAS points from DMM profile. 112 UCAS points from D*D* profile. Acceptable only when combined with TWO other Level 3 qualifications. Minimum Grade 28 points required. Acceptable on its own or combined with other level 3 qualifications. Core plus combined other Level 3 qualifications CACHE Diploma in Child Care and Education Minimum Grade B required (120 tariff points). Minimum Grade B required (120 tariff points). Completion of full year (transcripts will be required). K101 is acceptable with another level 3 qualification. 112 UCAS points from a maximum of 5 Scottish Highers and 3 Advanced Highers at Grade C or above. Full award required, plus GCSE English Language and Mathematics at Grade C or above. 14-19 DIPLOMAs in Society Health and Development To be achieved in Advanced Diploma or Progression Diploma 120 UCAS points from an A Grade. 112 UCAS points from an M2 Grade OCR National Diploma or National Certificate in Health and Social Care or Science Grade D. Acceptable only when combined with other Level 3 qualifications. Full award (60 credits) of which a minimum of 45 must be at Level 3 including 24 at Merit or Distinction, of which a minimum of 18 must be in a Science or Health related subject and 15 at Level 2 which must include Mathematics and English Language GCSE equivalent if not already achieved. If an applicant is studying an Access qualification or has already achieved an acceptable Level 3+ qualification, but is missing an acceptable Level 2 qualification, then they will be asked to complete Functional Skills Level 2 Maths and/or English Language (as applicable) by the 31st July alongside the GCSE they are studying. Applicants’ qualifications that are not listed will be considered on an individual basis. Those who meet residency/academic requirements of UK students but whose language is not English will need to hold IELTS with an overall score of at least 7.0 with no element below 6.5. Applicants must provide evidence of having been in general education for a minimum of 10 years. Applicants must demonstrate evidence of literacy, numeracy and IT skills. Applicants must provide evidence of study within the last 5 years. No offers are made without a face to face interview. All offers are subject to satisfactory Occupational Health Clearance, Disclosure and Barring Service report and, registration with Independent Safeguarding Authority. Applicants should be aware that qualifications, personal statement, interview and references all form part of the selection criteria for this course. I really want to become an Operating Department Practitioner but do not meet your entry requirements. What advice can you give me? All applicants must meet our academic entry requirements in order to be considered for the course. If you do not have sufficient Level 2 and Level 3 qualifications we advise you to consider undertaking a course which will give you the opportunity to gain the correct entry criteria. For example, an access course in a health/science-related field at your local further education college. This course contains the right mix of level 3 and level 2 qualifications which allow you to access higher education. Alternatively, you could undertake the Open University K101 course, as long as you have the appropriate GSCE qualifications (as defined in our entry criteria) with another level 3 qualification. A working knowledge and understanding of bioscience at the beginning of the programme is essential in providing the basis for future learning in clinical practice and providing holistic, patient centred care. The module will provide you with this essential knowledge and will encourage you to explore and develop your understanding. It will enable you to better apply clinical theory to your practice and to develop your skills as a practitioner. This module focuses upon the basic principles and responsibilities that underpin professional practice for the student who is aiming for professional registration with the Health and Care Professions Council (HCPC). It will introduce you to some of the fundamental principles that underpin care within the National Health Service (NHS). This module provides you with an introduction to the role and responsibilities of the Operating Department Practitioner (ODP) working in anaesthetics and post anaesthetic care and delivers essential knowledge required for working within a modern operating department, delivering safe and effective perioperative care. This module will focus upon basic anaesthetic and post anaesthetic care techniques, equipment, monitoring and the importance of working within national standards and organisational guidelines to deliver high quality, evidence based holistic care. You will concentrate on patients undergoing elective procedures in conjunction with a registered practitioner. Surgery is an essential component of health systems across the globe. This module provides you, a first year student Operating Department Practitioner (ODP) on the Diploma in Higher Education and BSc ODP programmes, to study the fundamental principles of surgical practice as part of the multidisciplinary team. This module introduces you, a student Operating Department Practitioner (ODP), to the essential knowledge required for working in a modern operating department and delivering safe and effective perioperative care. The module focuses upon a holistic, patient centred approach that encourages students to become autonomous, dynamic, reflective and self-directed learners within the three perioperative phases of Anaesthetics, Surgery and Post-Anaesthetic Care. The application of physiology and pharmacology in clinical practice is fundamental in providing high quality patient centred care. Additionally, an understanding of the scientific principles that provide the basis of clinical monitoring and investigation are essential to the operating department practitioner. 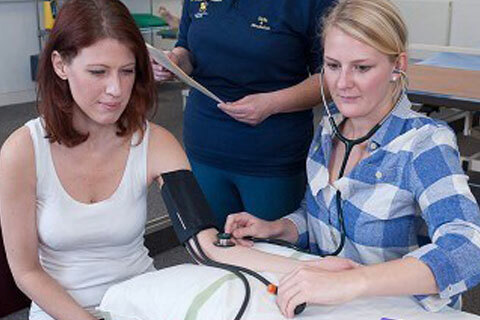 The focus for this module is evidence based practice and its relation to clinical practice. You will build upon your critical and analytical skills that you developed during the first year of your programme. As part of the module you will learn how to approach literature in a critical and analytical way discovering the various ways that data can be collected, turned into information and how this can be used to develop and enhance best practice. You will appreciate why certain research methodologies are used to help answer certain questions and add the ever expanding knowledge base around perioperative practice. The focus of this module is around the development and maintenance of a culture of safety within the perioperative environment. This culture will be explored and discussed in this module within the context of ‘Human Factors’ and their relationship with healthcare. This module will enable you as a second-year student ODP to develop your role, skills and management of anaesthetic and post-anaesthetic care to a level capable of delivering care to patients with complex needs that may be undergoing elective, non-scheduled or emergency procedures. You will build upon prior knowledge, skills and experience that you acquired in the first year and this module will relate to all other level five modules within the programme in order gain transferable knowledge. This will enable you to identify and justify how your role impacts upon the safe and effective care of the increasingly complex patient within all aspects of the perioperative environment. In your first year of the DipHE and BSc (Hons) ODP programme you studied the fundamental principles of surgical practice and identified the role of the scrub and circulating ODP as a member of the multidisciplinary team. This module allows you to develop your role as a circulating and scrub ODP to a level capable of dealing with the scheduled, non-scheduled and complex nature of surgery. Using knowledge and skills you acquired in the first year and other second year modules such as the Applied Bioscience and Perioperative Care modules, you will critically examine how your role, the decisions you make as well as the role of others impacts upon the safe and effective care of the patient during the intraoperative stage of their perioperative journey. This module will test your abilities to educate yourself, to demonstrate your expertise in collecting and analysing information. It will draw upon and utilise the academic skills that you have developed during the first two years of your programme. It will give you the opportunity to carry out an investigation into an area of professional practice and produce a written piece of work up to the standard required for publication in a health care journal. It will be based on the best evidence to support your professional practice. The module prepares you to be a professionally aware, autonomous and reflective practitioner at the point of registration and enhances your employability skills on qualification. It is designed to prepare you for the transition from student to Registered Operating Department Practitioner and develop skills to support your continuing professional development alongside the ability to manage yourself and others. This module considers the wider context of the publicly funded system of healthcare in the NHS which operates within a complex environment with its economic, political and social dimensions; and is significant for your development as an Operating Department Practitioner as you gain an understanding of the pressures on, and accountability of the service you provide. The third year BSc (Hons) Operating Department Practice programme is designed to prepare you for the demands of perioperative practice once you are qualified and registered with the HCPC. This Enhanced Anaesthetics and Post Anaesthetic Care module provides you, a third-year student ODP to take an individual and holistic approach to the assessment, planning, management and evaluation of care for acutely ill patients having undergone complex, non-scheduled or emergency care. You will build upon your prior knowledge, skills and experience as an anaesthetic and post-anaesthetic care practitioner acquired in the first, second and third year modules to develop as a critically thinking practitioner as you prepare to provide competent and skilled anaesthetic and post-anaesthetic care. The third year BSc (Hons) Operating Department Practice programme is designed to prepare you for the demands of perioperative practice once you are qualified and registered with the HCPC. This enhanced surgical skills module allows you as a student ODP to develop enhanced surgical skills that includes clinical skills, teamwork and communication to enable you to provide high standards of perioperative care as an interprofessional member of the surgical team. You will build upon your prior knowledge, skills and experience as a scrub and circulating practitioner to develop as an autonomous practitioner as you learn to provide competent and skilled surgical assistance to the operating surgeon under supervision. Your programme is delivered using a modular approach and divides the content of the programme into manageable elements of study and practice learning opportunities. Adapt to different practice settings and be proactive in identifying and responding to your development needs. The knowledge and skills in relation to the 3 main areas of perioperative practice; anaesthesia, surgery and post-operative care are introduced, developed and enhanced over the 3 year duration of the course. The module delivery is arranged in blocks to allow you to apply your new knowledge in the clinical setting. You will experience a mixture of teaching, self-directed study and practice-based clinical placements, spending 60% of your time each year on placement. Successful completion of this programme gives eligibility to apply to the Health and Care Professions Council for registration as an Operating Department Practitioner. You will spend between 25 - 30 hours per week in the classroom when on study block. Operating Department Practice student Katrina Ballie explains how enrolling on this course has benefited her and enhanced her career prospects. Successful students can apply for registration with the Health and Care Professions Council. This course is approved by the Health and Care Professions Council, and will give you eligibility to apply for registration if you successfully complete the course. This course is awaiting endorsement from the College of Operating Department Practitioners, the professional body for the profession. You can specialise post-registration or move into management or teaching. A comprehensive portfolio of post-registration short courses that focuses on Continuing Professional Development (CPD) is available, along with other postgraduate schemes. Many are taught as part-time flexible modules to fit around your work and domestic commitments. Advice is available on an individual basis on request, with reference to appropriate subjects, levels and routes of access. Filled with state-of-the-art equipment, our SPACE (Skills Practice and Care Enhancement) area is the perfect place for you to practise a wide range of skills at your own pace. Watch our video to see how access to SPACE has helped our students to succeed. To prepare students to meet the requirements for eligibility to apply for entry onto the Health and Care Professions Council register as Registered Operating Department Practitioners. Combines theory with clinical placement to enhance awareness of different specialities in preparation for employment in operating theatre departments. Develops transferable skills for working in a range of health care settings and recognising the need for life-long learning. You will be required to travel for your clinical placements to engage in a broad range of specialities and practice areas. These placements will be with both NHS and independent health providers across the West Midlands. It is important you appreciate that fees for accommodation and/or travel will require personal financial outlay; these may be reimbursable to some extent, the most up-to-date information can be found on the NHS Business Service Authority website and the administrative team can also advise. Additionally there is no guarantee of a placement in a specific hospital or area. Previous graduates are now holding management posts within the NHS and private sector. Alumni have senior educational posts in the NHS and as part of the course teaching team. This includes individuals who have published and presented at a national level. The very nature of the Operating Department Practice course is that it is a professional program leading to eligibility to apply for registration with the HCPC if successful. The course develops essential skills enabling you to practice safely and effectively as a Registered Operating Department Practitioner and gain employment post qualification. However, we also want to encourage you to think about your potential future career path and help you plan your development to meet your long term expectations. Future career choices and development may lead to roles in the following but not limited to management, education, extended health care role (perioperative care practitioner, surgical first assistant). The programme encourages students to attend study days and conferences to develop their learning. Students can apply for funding support for attendance. Funded opportunities, for examples trips to specialist equipment manufacturers, are arranged when appropriate. We boast up-to-date, innovative facilities that simulate the real situations that medical staff may come across. These resources are essential in offering students a hands-on introduction to health and social care practice. Much of our teaching is carried out within our state-of-the-art, £30m Seacole Building, which houses cutting-edge learning facilities. In a sector where new techniques are constantly being discovered, we work hard to ensure that students learn using the most up-to-date equipment available. These include the only mock operating theatre in an English university and a cutting-edge radiography virtual clinical training facility, virtual ward and virtual case creator. The mock operating theatre is set up in the way that you would it find in a hospital, with all of the machinery, tools and equipment necessary. Operating theatres can be daunting and confusing places on first view but with access to our mock theatre, you will be able to build up confidence and feel comfortable in your working environment. The SPACE (Skills Practice And Care Enhancement) learning facility lets you further practice the skills taught in class, at your own pace and convenience. It is fully stocked with the specialist items and equipment needed for procedures such as taking blood pressure, giving an injection, abdominal examination of a pregnant woman and caring for ill babies in an incubator. The Seacole library, based at City South Campus, is one of the UK's largest specialist health education libraries. The state-of-the art facility offers an extensive range of range of information and reference materials set out in a relaxing environment, conducive to studying. There are comfortable seating areas, group study areas, a silent study area and private study rooms. The academic team are dedicated to the development of future caring professionals and have many years of experience delivering perioperative education in the academic and clinical settings. The teams’ experience of delivering perioperative care in the ‘real world’ provides an excellent resource to develop an understanding of the relationship between theory and practice. Additionally, the team are committed to the enhancement of perioperative care more widely through publication and information sharing in the wider healthcare environment. Simon has worked at the University for just over 10 years, prior to this he was in the British Army for nearly 30 years. During this time he served in many areas both in and out of the United Kingdom. His job roles during this time were varied including working as an Operating Department Practitioner, Theatre Manager, Staff Officer and Office Commanding of a small Hospital. During his time at Birmingham City University he has been involved in the development of the current Operating Department Practitioner curriculum and has ran modules primarily in the second year of the program. He has many interests around the student academic experience and is currently undertaking a number of Master of Education Modules to further enhance his teaching and learning experience. Simon is also a member of a number of committee’s within the Health Faculty and teaches on the Paramedic Science Program in addition to being the pathway manager of the Faculties’ Perioperative Practice Pathway which offers further study opportunities for qualified nurses and Operating Department Practitioners. Julie has spent 25 years working within the perioperative environment. In her last NHS post she worked as a Surgical Care Practitioner in general surgery at Trust within the West Midlands. Julie is passionate about perioperative care and has a particular interest in surgery, research and advancing surgical roles.